1. Host Taye Diggs kicked the night off with a song-and-dance number that highlighted the diversity among the night's nominations. 2. John Krasinski was shocked about his win for A Quiet Place. 4. William Jackson Harper and Manny Jacinto from The Good Place redefined menswear in one single photo. 5. Elsie Fisher won for Eighth Grade and gave a relatable, quick speech that started with, "Wow. This is real cool. As someone with anxiety, it's very fun to be on this stage right now." 6. Taye Diggs flirted with Angela Bassett right in front of her husband Courtney B. Vance. 8. Sarah Silverman kinda-sorta made a Bird Box joke while presenting. 9. Jake Johnson and Shameik Moore got their Spider-Man poses down on the red carpet. 10. Eugene Levy and Catherine O'Hara were surprised when they went to read the winner for Best Actress in a Limited Series and it was a tie! 11. Amy Adams was introduced first, but she didn't want to give her speech until the other winner was announced, too. 12. So she and Patricia Arquette gave their speeches at the same time and it was all kinds of wonderful. 13. 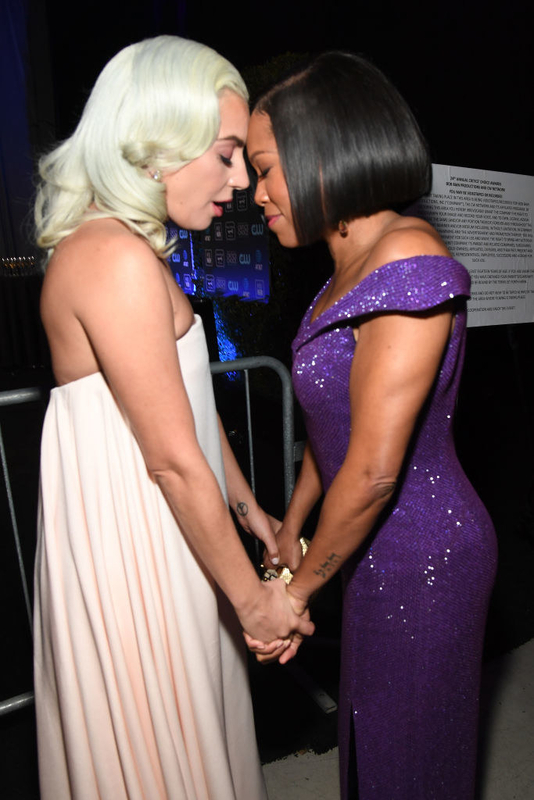 Lady Gaga and Regina King had a moment backstage. 15. The cast of Crazy Rich Asians celebrated their win for Best Comedy. 16. Taye Diggs serenaded Spike Lee, who half-tolerated it. 17. Sandra Oh thanked her Killing Eve co-star in her speech and called her "my obsession, my other half." 18. Rami Malek met Nicole Kidman. 19. Amy Sherman-Palladino wore her lucky hat and The Marvelous Mrs. Maisel won for Best Comedy Series. 23. And she made sure to let the people trying to play her off early that a piano would stop nothing.